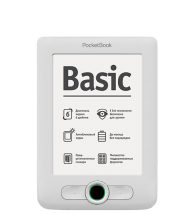 “PocketBook Basic New” Is a new model that will definitely suit those who are taking their first steps into e-reading at a very affordable price – especially that its functionality and control principles are easy-to-understand especially for beginners. It also promises a paper-like reading experience with a lot of advantages such as storing and carrying a large amount of books in a slim and portable reader. Most importantly PocketBook Basic hits all the right notes: E-Ink screen safe for eyesight technology, affordable price, optimized performance, latest software, multi-format file support, reliable performance and the possibility to store large amounts of electronic content. 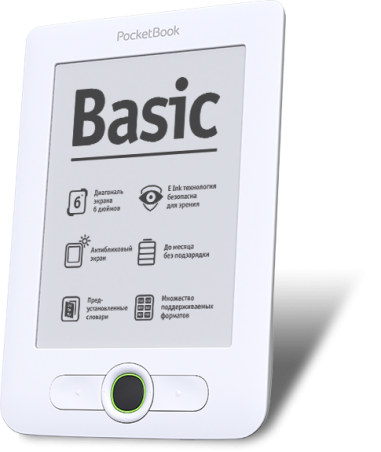 “PocketBook Basic New” is based on an E Ink display technology. Its main advantage is the absence of the flicker effect which is typical for LCD-displays and causes eye strain. The screen, 6" E Ink® Vizplex, 166 dpi, with a resolution of 800x600 pixels, and supporting 16 levels of grey which better diplays complex texts and illustrations. The new model contains the latest version of Linux OS which is constantly optimized and upgraded by our Software engineers to provide the best performance. Also, you will always be one step ahead in e-reading owing to the regular firmware upgrades. “PocketBook Basic New” is based on an 800 MHz Freescale processor which provides a highly interactive device that reacts almost immediately to any key press. “PocketBook Basic New” has a newely designed control interface, which provides a rapid access to all relevant information. It is simple, easy-to-use and marks a new step in reading performance and usability compared to previously released editions. When switching on the device, the main menu appears showing the most relevant items such as your library, applications, notes, settings. A list of notifications and recently added and currently read books is displayed on top of the menu. This new Main Menu will significantly ease reading several books simultaneously as well as managing your electronic contents. You can start reading immediately after purchasing “PocketBook Basic New” which comes with a huge collection of free books pre-installed, published in more than 10 foreign languages. You may also be interested in benefiting from some of the useful applications and entertaining games that comes with your new device such as PhotoViewer, Calculator, Dictionary, Calendar&Clock, Klondike, Sudoku, Snake, Chess. The storage capacity of “PocketBook Basic New” is 2GB* internal storage, as well as an extendable Micro SD slot that provides the possibility of adding an external Micro SD memory card up to 32 GB. For “PocketBook Basic New” owners, reading in broad daylight will be a comfortable and easy task due to the multiple aspect angles support and the anti-glare technology. One can easily read books on the electronic PocketBook reader even on the sunniest day. If necessary, the refresh mode can be activated without screen black-outs – it`s just a matter of enabling this feature in the settings. “PocketBook Basic New” is distinguished by its support of for multiple formats customary which is a common key feature for all PocketBook devices. The device supports 15 text formats - PDF (ADOBE DRM), EPUB (ADOBE DRM), PDF, EPUB, FB2, TXT, DJVU, RTF, HTML, CHM, DOC, TCR, FB2.ZIP, PRC, DOCX and four graphic ones - JPEG, BMP, PNG, TIFF. “PocketBook Basic New” model is to be one of the slimmest and light weighted e-readers in the PocketBook product range. You may use this easily-portable device almost anywhere. The package is even more streamlined than before and the new material used on the back panel will give you a better, more comfortable grip holding the device. The control keys are placed at your convenience making it easy and comfortable turning book pages while holding the device using a single hand. There is a 5-position control joystick and 2 page-up keys placed in the front panel, to suit your reading experience and provide a very efficient and functional experience. One of the new features of the updated PocketBook Basic software is the improved functionality of viewing PDF format.This is particularly important for 6-inch readers without multi-touch display. There are 5 available modes for viewing your PDF-files that allow you to read in your most preferred manner, i.e. customize the page width, crop page margins, whole page viewing, columns view (2-3-4 columns) and text reflow. You can instantly change the text size while reading by using the “up/down” keys. You will also be able to use preinstalled dictionaries while reading without having to switch screens.